My Life in Chile: ¡CHI-CHI-CHI LE-LE-LE VIVA CHILE! The soccer game was awesome. 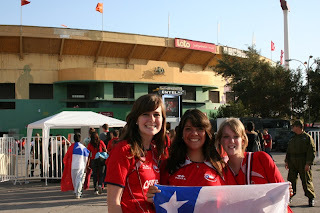 We traveled to Santiago to see Chile play against Uruguay at their national stadium. Our seats were great and were able to see all the action from all angles. I’ve never seen such high-spirited people at a soccer game and go as crazy as the Chileans do! 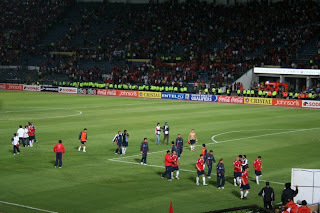 Although, soccer here is the equivalency to football in the US, security was unbelievable. 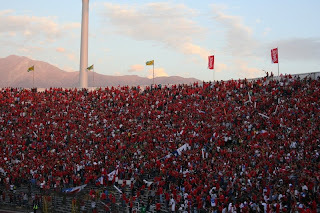 The entire stadium except a sliver was completely red filled with Chilean attire and spirit. It was unbelievable, but so much fun! And the things they would yell to the opposing team… I’m not even going to repeat them here, but let me tell you, it was definitely a cultural experience. 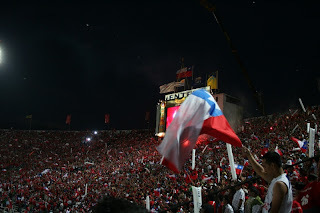 I enjoyed being there among the thousands of Chileans, yelling and cheering for our team. It was a great time and I imagined how the game was for those who were not there… the yelling and cussing echoing through the neighborhoods. Oh how I love Chile!